Is this the same Apple we’ve known for all these years? Well, the company has evolved leaps and bounds after the Steve Jobs era. Apple under the guidance of Tim Cook is doing things that we never thought we will ever get to see from the Cupertino giant. Starting from a plastic iPhone to all those cheeky ads mocking its competition, we’ve seen it all. Perhaps, the only thing that went missing was a big iPhone, but it’s here today – however, it took a long time coming. Apple always said that they do things their way and don’t care about what other manufacturers are doing, but the time has come where the company has left is arrogance behind and produced a device that most of you were asking for. Apple iPhone 6, the latest smartphone from the Cupertino giant – which they like to call ‘bigger than bigger’, is the answer from the company for all the competition flagship smartphones out there. In the past it was believed that it takes another iPhone to beat the iPhone, but does that hold true even in 2014? Well, let’s dive deep and find out how good the newest generation iPhone is against its competition. 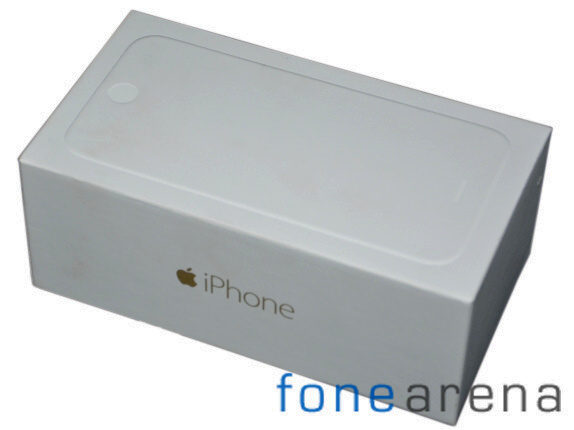 Apple iPhone 6 comes in a white box that is similar to what its predecessors were packed in. There’s a small change though, the real image of the iPhone is no longer printed on the box, but you now get to see an outlined image of an iPhone. All the box contents that was bundled with the previous generation iPhone is retained, which means you get USB cable with a lightning connector, the popular earpods headset, an AC adapter, SIM eject tool, some leaflets and of course the customary Apple fan stickers. We don’t think there’s a need to talk about the quality of all the accessories, but if you are a new Apple fan, then you must know that these are the best standard add-ons available in the market. After holding its ground for a very long time, Apple has finally moved on and produced an iPhone with a larger 4.7-inch screen. In today’s standards, the iPhone can only be compared size wise to mini Android phones and not flagship units. 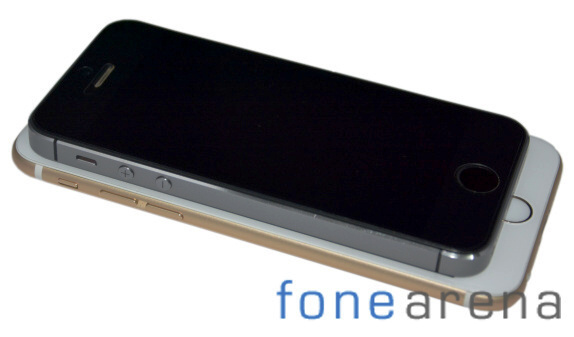 We are quite disappointed with the iPhone 6’s screen-to-body ratio. Google in association with LG have managed to squeeze a 5-inch screen on the Nexus 5, which more or less has the same body frame size as that of the latest iPhone. There’s literally nothing to talk about the overall build quality – it’s flawless. The unibody construction is of great quality and the class that it offers is something that you expect only from Apple. All in all, everything about the iPhone 6 build is just perfect. For starters, the iPhone 6 brings a new design language. The glass panel on the back has been scrapped and it is now replaced by plastic lines on top and bottom. Apple says that they need them so that the internal antennas can pick up the signal through metal back. These plastic strips are probably the only thing we didn’t like in this year’s redesign. They look awfully bad especially on the gold variant and feels very cheap. The edges on the new iPhone are rounded and are one of the significant changes in the design. We think it’s a nice tweak, but there’s a trade off as well – the phone is rather slippery and you need to be a bit careful while handling it, else you might end up dropping it quite often. At 6.9mm thick, the iPhone 6 is the slimmest iPhone to date. The device weighs about 129grams, which is light considering its size, but it’s about 17 grams heavier than the previous model. 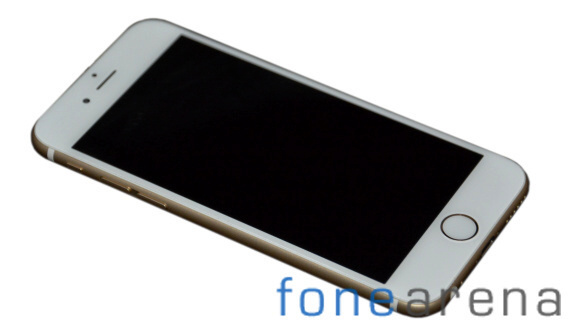 The design layout of the front is similar to iPhone 5s. The 4.7-inch display eats up most of the space and the Touch ID that also doubles up as a home button is placed below it. The earpiece, the usual array of sensors like proximity and ambient light along with the front facing camera are placed on the top. On the left, there are three buttons – mute toggle, volume up and volume down. The power button has been relocated to the right side and it makes perfect sense considering the device is a lot taller now. Next to the power key, you can find the nanoSIM card tray. 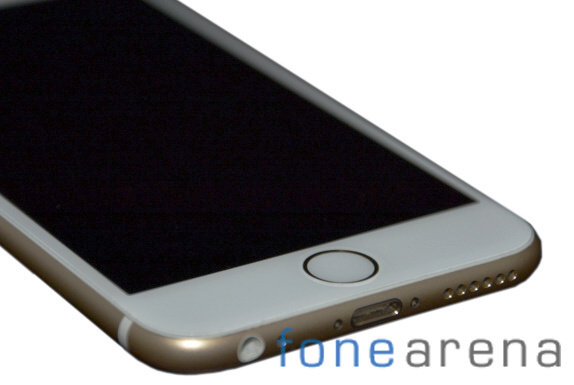 The top of the iPhone 6 is completely bare. The bottom features the lighting port, micro speaker holes, 3.5mm audio jack and the primary microphone pinhole. Moving on to the back, we see the 8 megapixel rear camera with dual tone LED flash and secondary microphone pinhole. It is quite disappointing to know that the camera lens on the rear protrudes and it also wobbles the phone when kept on a flat surface. It is best if you can secure the phone with a case, else the camera lens might get scratched easily. As always, the battery on the newest iPhone is non-removable. Apple iPhone 6 sports a 4.7-inch IPS LED-backlit LCD screen with a resolution of 750 x 1334 pixels that accounts to a pixel density of 326ppi. Apple calls it Retina HD display. The bezels on top and bottom of the screen takes a fair share of space and results in a taller size. But, with the home button, the customary design and in an attempt to keep the smartphone thin, Apple seems to have had no option other than having large bezels. 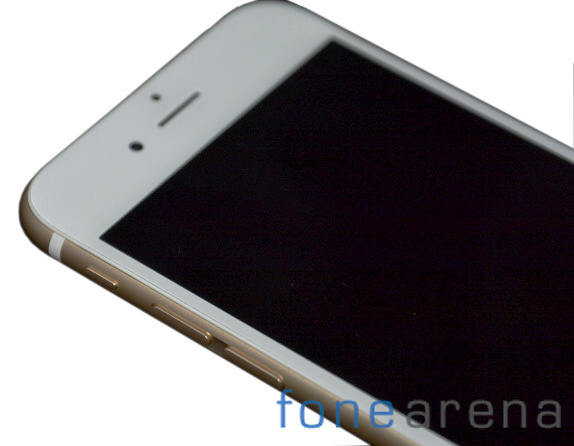 Apple has covered the front with a scratch resistant glass, which according to them is the strongest in the industry. The color rendering is accurate and as one expects, the viewing angles on the iPhone 6 are great. The characters of the iPhone 6 display are quite different than the one on the iPhone 5s. The screen is brighter than the previous model, but the blacks are not as deep as the ones on the 5s. So, eventually the contrast ratio of the both the models are quite similar. However, the brighter display on the iPhone 6 results in improved sunlight legibility. The iPhone 6 comes out of the box with iOS 8. It doesn’t bring many changes to the existing user interface and having completely revamped it last year, we weren’t expecting too many tweaks in its latest release. You can now interact with the pop-up notifications directly from the banner, discard alarms, comment or like on facebook and mark tasks as complete. 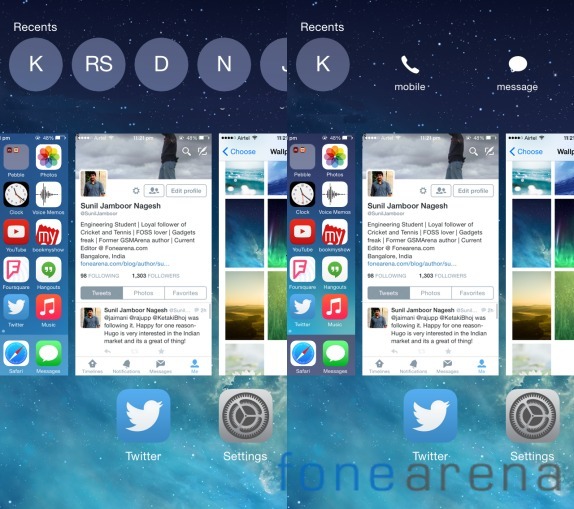 The task switcher has been re-designed and it now sports an extra row at the top. It features a list of recently contacted friends and you can call or message them right from the task switcher. Spotlight search has got a lot better from the previous release. The tool supports smart suggestions and is capable of showing results from Wikipedia, IMDb, nearby places, App Store, iTunes content, iBooks and other popular news sources. While the latest generation iPhone has got a lot bigger, Apple has introduced an easy way to reach the status bar for notifications. If you tap the home key twice, the entire UI will scale down and you access it with your fingers easily. 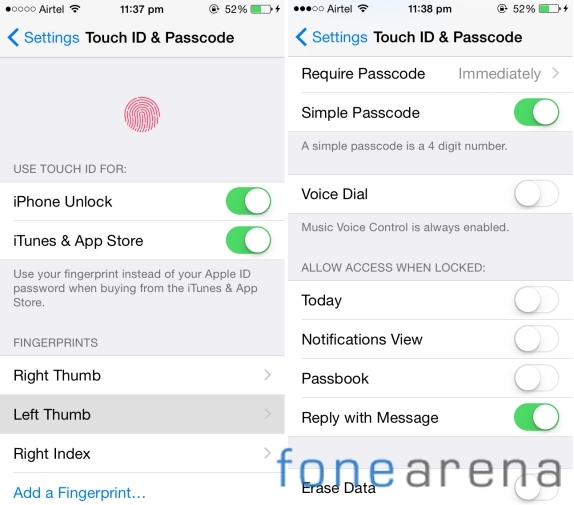 Just like the iPhone 5s, the newest iPhone also comes with Touch ID – a fingerprint recognition service. The performance of the sensor, which is placed under the home key, has been enhanced and it now recognizes your finger very quickly. You can register up to five fingerprints, but Apple warns that if you register five fingerprints it will impact the performance and the operation of the Touch ID sensor. The Touch ID is integrated with Apple Pay service as well. After verifying your credit card information, the contactless pay can be confirmed via Touch ID. 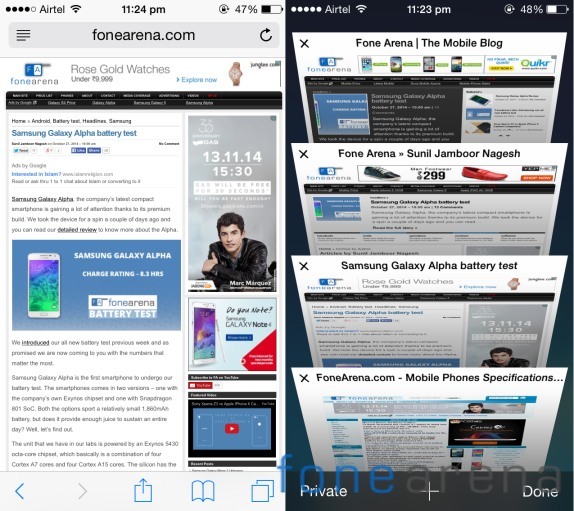 Apple’s home backed mobile web browser now supports extensions through its contextual menu. 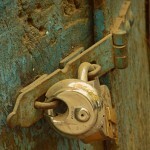 Safari can now auto-fill web forms, translate webpages and even use the TouchID features. The private browsing has been improved and it will no longer ask you to convert all your tabs into private. Siri on iOS 8 has improved a lot and it now comes with Shazam integration. You can now just open Siri and let her listen to a song, before she tells you the name of the song and provide you with an iTunes download link. You can get Siri up and running by simply saying “Hey, Siri”. The virtual assistant now has the ability to dictate in 24 new languages and will help you save a lot of time typing on the keyboard. 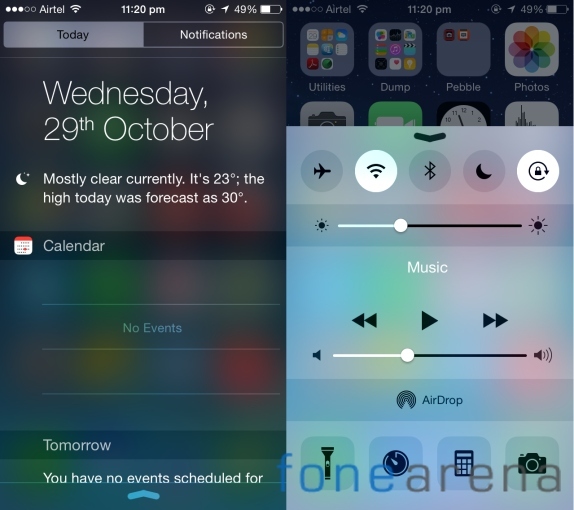 You can check out our detailed iOS 8 review to know more about the Apple’s latest mobile operating system. 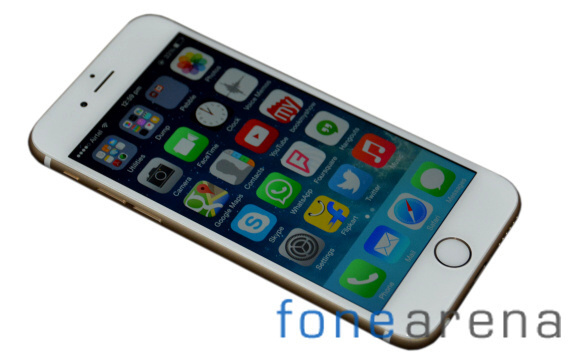 Apple iPhone 6 is powered by the company’s next generation Apple A8 chipset. The newest silicon is manufactured by 20nm process, which basically means that the build components will be much smaller in size and the SoC will produce less heat and consume less power. Apple’s A8 chipset packs a dual-core 64-bit Cyclone processor running at 1.4GHz, which is about 100MHz faster than the previous generation A7 chip. The chip also brings a new PowerVR GX6450 GPU with quad-core on board. We decided to run some synthetic benchmarks to determine the performance of the device and also to stack it up against other iPhone models. 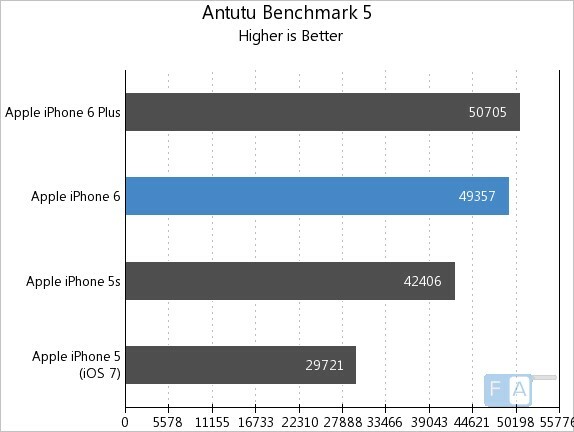 First up was the AnTuTu benchmarking, which reveals the overall performance of the smartphone. With a score of 49,357 points, the iPhone 6 is far above its predecessor and just below its bigger brother, the iPhone 6 Plus. 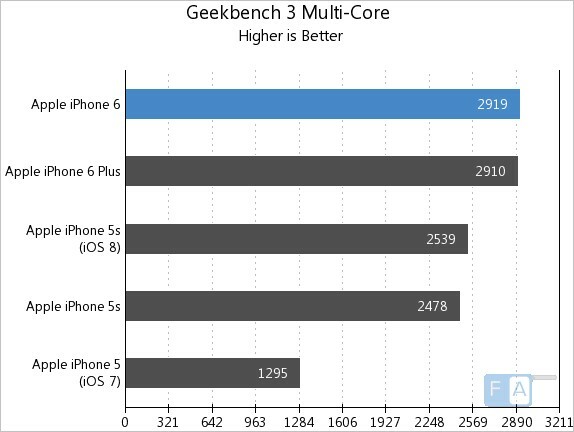 We then had the iPhone 6’s CPU and memory sweating it out in the Geekbench 3 benchmarking test. 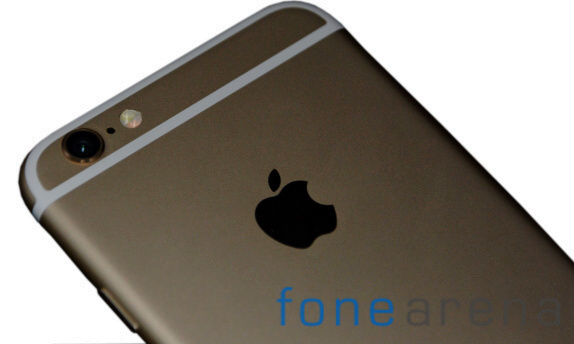 The iPhone 6 came out on top with a score of 2,919 points, which is about 15% performance boost over the iPhone 5s. Next up was the GFX Benchmarking. The iPhone 6 managed to score 49.5 points, which is quite surprising. The test was upscaled due to the lack of support, but the difference in the resolution doesn’t change the results. Lastly, we had the new PowerVR GX6450 GPU running at full pace. 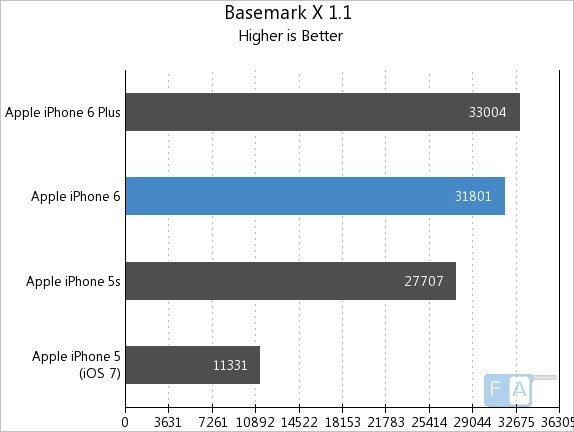 The basemark X graphics benchmark result reveals that the iPhone 6 is among the best phones in the market. The new GPU on the A8 is a monster and is definitely ahead of the Adreno 330 and Nvidia Kepler at the moment. 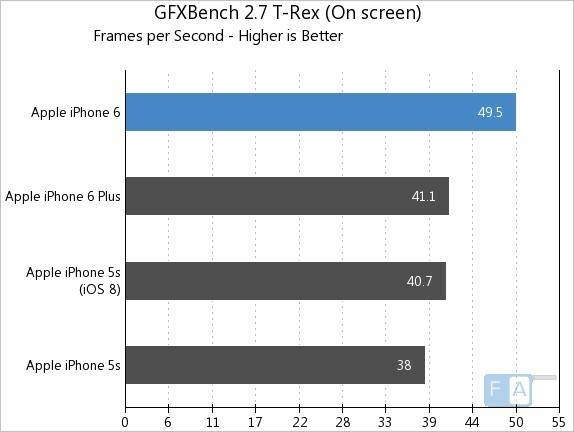 If you go by the raw performance, the Apple iPhone 6 will deliver great user experience than any other previous iPhones. Check out the gaming review. The iPhone 6 has an 8 megapixel sensor – which is essentially the same unit that was used on iPhone 4S about three years ago. However, it’s a new camera altogether when you consider the technology used under the hood. The new sensor comes with built in phase detection auto focus that the company likes to call it focus pixels. The camera now shoots a lot faster and the focus along with digital video stabilization has been improved. The sensor is now capable of capturing high speed videos at 120fps and 240 fps, however there’s still no 4K recording option. 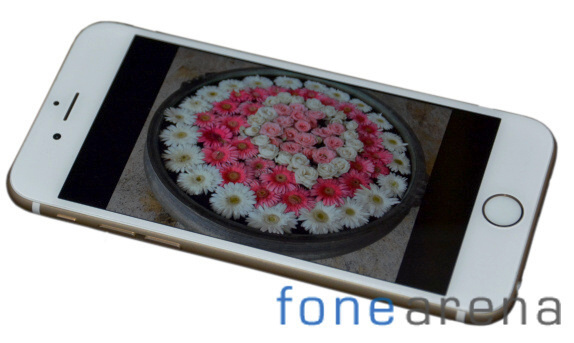 The front facing sensor remains the same – 1.2 megapixels, but it now has a wider F/2.2 aperture. It can now utilize the auto HDR feature for photos as well as for videos. Apple iOS 8 featured an improved camera interface and obviously the iPhone 6 brings all those enhancements. There’s a lot more freedom for photographers now and you can now access exposure and control it by adding or compensating depending on the image scenario. 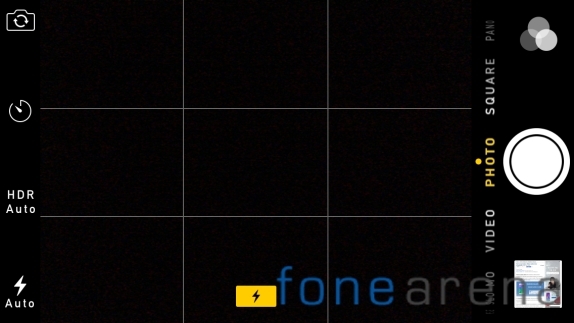 You can now switch to front camera, set timer, choose HDR modes and even play with flash settings very easily. Shooting with iPhone 6 is bliss. 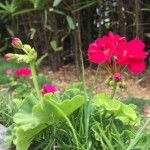 You will notice the improvements in various aspects as soon as you start capturing images. The time between each shot is impressive and the processing of the HDR photos takes place within a blink of an eye. 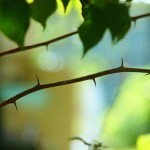 We took the camera for a spin and capture some images for you. The overall dynamic range is great and you don’t even need HDR for capturing brighter and darker fragments in a scene. Considering the fact that iPhone 6 has an 8 megapixel camera, the detail per pixel is quite impressive. The sharpness of the objects is good when compared to iPhone 5s. You can shoot images with HDR mode, which captures two images and stiches them together to get an exposed image with better dynamic range. The low light photography has gotten better as well. 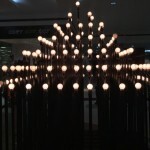 You can lower the shutter speed at low light and capture some images with good exposure. 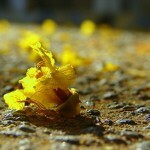 However, if you have a shaky hand, then you might often end up with blurry images due to the lower ISO. 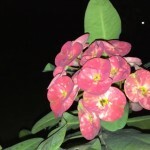 Apple iPhone 6 camera also has the ability to capture panoramas with a maximum resolution of 43 megapixels – a huge improvement over the iPhone 5s panoramas. 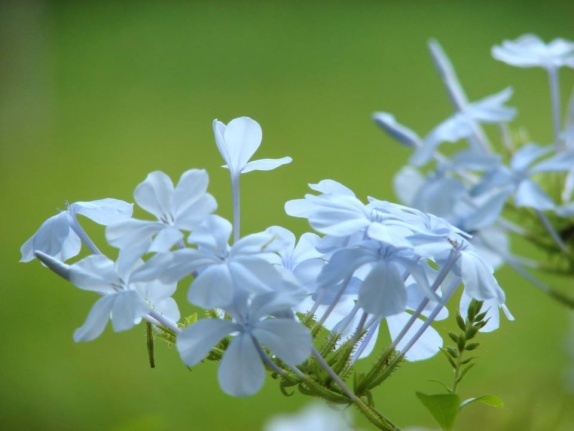 All in all, if you are a photography enthusiast you will love capturing images with Apple iPhone 6. The iPhone 6 camera is not only good for still photography – it can also do a great job as a video camera. The sensor is capable of capturing FullHD 1080p videos at 30fps, fast motion 1080p videos at 60fps. Furthermore, you can also record slow motion 720p videos at 120fps and also at 240fps – which is a great job considering there’s no loss of resolution. All the FullHD videos at 60fps are very fluid and smooth as compared to 30fps ones. The detail level is unchanged and the overall quality is just great. Shooting slow motion videos is a lot of fun. However, with 40Mbps and 27Mbps bitrate for 240fps and 120 fps videos respectively, they consume a lot of storage space. Just like the FullHD videos, the quality is pretty good and you are going to love the quality of motion reduction. Here’s a sample video we shot to show you all. Apple supports a wide range of connectivity options like LTE Cat. 4 (up to 150Mbps download, 50Mbps upload). It also covers multiple 2G and 3G network bands. The iPhone 6 supports voice over LTE (VoLTE), HD Voice and Wi-Fi calling, however these features are carrier dependent and varies from region to region. Apple iPhone 6 houses all the Wi-Fi a/b/g/n/ac standards, but AirPlay is the only way to stream your content to an HDTV and for now, it only works with Apple TV. It also features Bluetooth 4.0 LE and for the first time, iPhone has near field connectivity (functionality restricted to Apple Pay). Unfortunately, the latest version of iPhone still doesn’t support USB on the go, but you can pair a Bluetooth keyboard and utilize it. 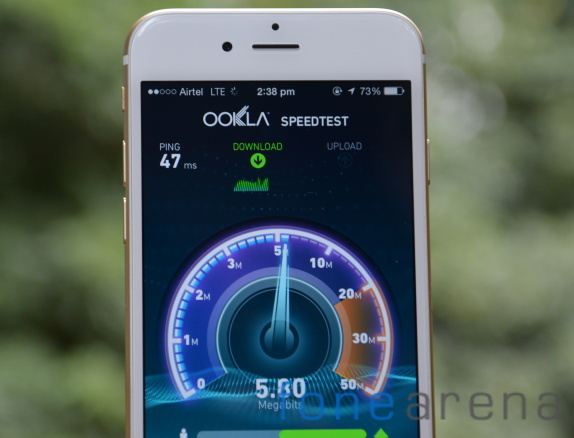 We had a chance to test what speeds the iPhone 6 is capable of achieving on the LTE network in India and you check out our detailed story to know more about it. In a world where numbers get more prominence than the actual results, Apple seems to be one of those companies who doesn’t care about it. The iPhone 6 comes with a non-removable 1,810mAh battery, which is a small number by today’s standard. However, the total endurance the small battery offers is quite surprising. 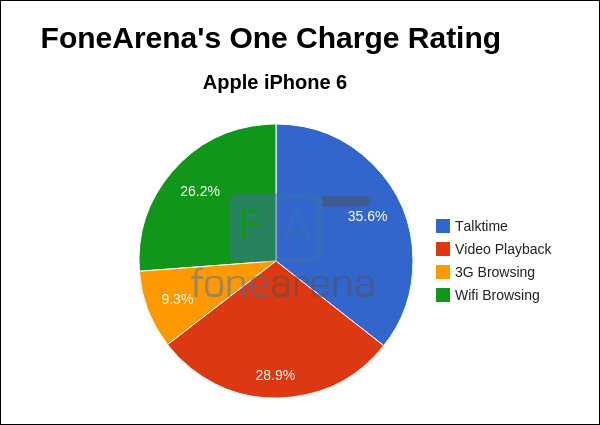 Our 24 hour charge rating for the Apple iPhone 6 is 8.73 hours. This means that the iPhone 6 can be used for more than 8 hours straight without having to find a power source to refill the battery. Samsung Galaxy Alpha, which is one the main rivals for the iPhone 6, comes with a slightly larger 1,860mAh battery, but with 8.3 hours charge rating – it is lesser than that of the latest iPhone. Apple’s software customizations help the battery last for an entire day if you are a moderate consumer. You really don’t have to be an Apple fan boy to appreciate the build quality and class of iPhone 6. It’s in Apple’s DNA to build products with exceptional attention to detail irrespective of its design. As tech enthusiasts we can just admire the overall build – mind you we are not talking about the design, internal hardware or software! 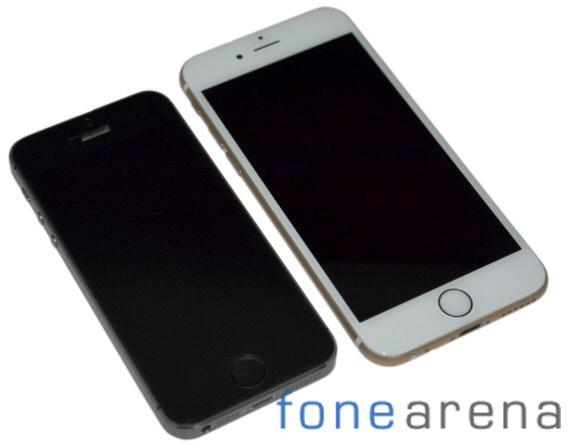 With a large number of consumers wanting to have an iPhone with larger screen, the iPhone 6 would have sold in millions even if it had the same hardware specifications of 5s, but with a larger screen. We are glad Apple didn’t choose the easy way. 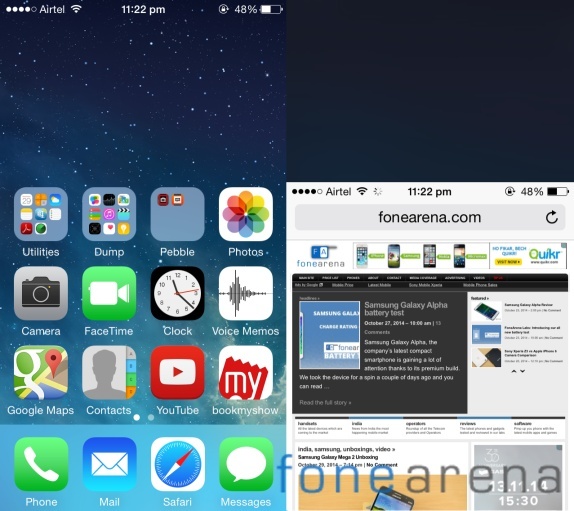 The iPhone 6 offers stellar performance and is definitely among the best smartphones we have seen this year. Camera and video recording is another department that blows our mind. The rear snapper on the Apple iPhone 6 is perhaps the best in the 8 megapixel league. It would have been icing on the cake if the camera had a slightly bigger sensor and the ability to shoot ultra HD videos. The camera bump is bit shocking and is so much unlike Apple, but you can easily cover it up with a case. The Apple iPhone 6 offers wide range of connectivity options and if you are traveler you would know how precious it is for a smartphone to support various network bands. Apple iOS 8 is nothing much to write about as the latest edition of OS is visually quite similar to the previous version and it offers more to do developers rather than end users. However, it does bring a few useful features on board. A 1,810mAh battery is small by today’s standards, but you can’t really complain about its life as it is on par with iPhone 5s despite the fact that it has high resolution screen and a faster processor. 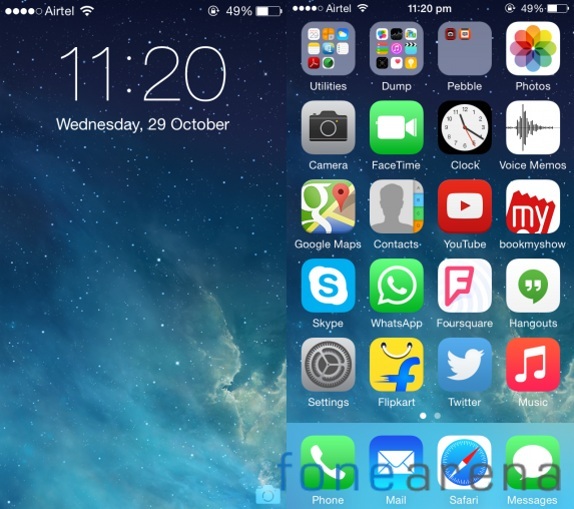 Apple iPhone 6 is surely the best iPhone to date and that’s beyond any shadow of doubt. Even though a bigger size iPhone is contradictory to what the company said before, it’s a move in the right direction. And, it’s also something that would please millions of consumers across the globe.